Then I looked at these same 5 authors’ published books in other languages (I am hesitant to say books “translated” into other languages, because I did not distinguish between the same book appearing multiple times in multiple languages from a book appearing once in a non-Italian language). As you will see, D’Annunzio is still the most prolific, but it is interesting to note De Amicis, whose books have been published in the greatest variety of languages. 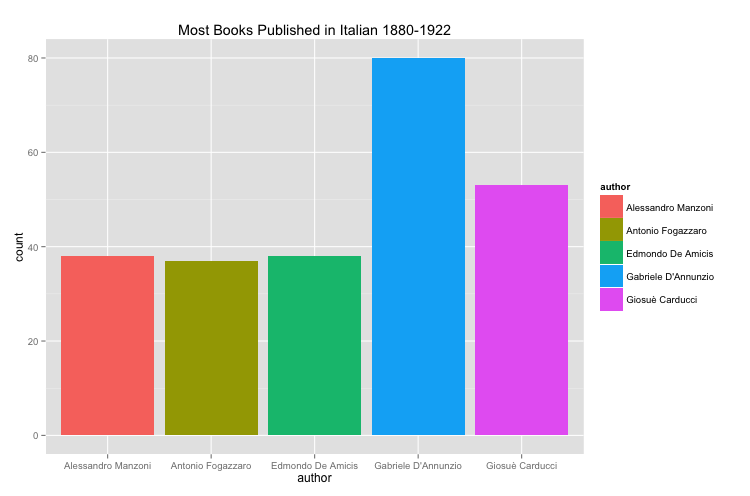 Finally, breaking away from the author-specific, I looked at the total number of books published per language for English, Italian, French, and German over this time frame. 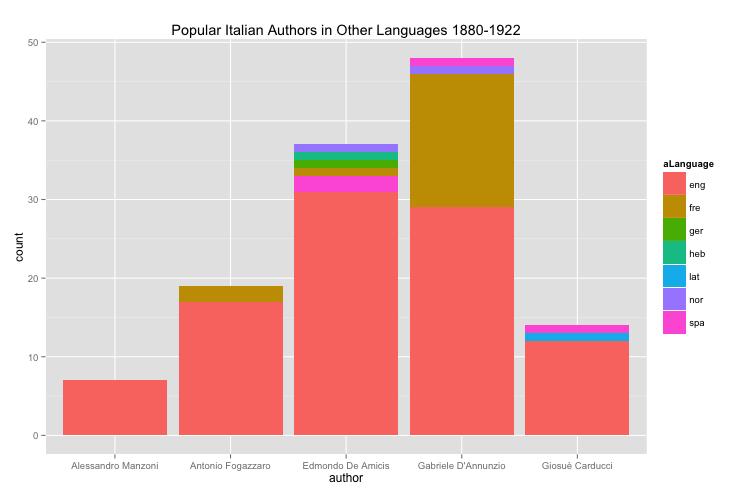 This is mainly to get a sense of the number of Italian books relative to other languages in the set. 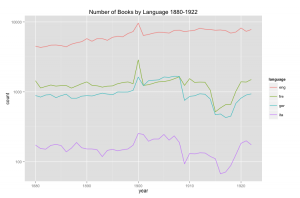 The one interesting thing I noticed, is in the early part of World War I, around 1914-1915, it seems there is a steep drop in German, French, and Italian, whereas the English language books remain steady. Any idea why D’Annunzio is so popular in French compared to the rest? One note on the last chart, which I think I’m seeing there. The drop in foreign language books is probably due to the difficulty both of publishing in the war and getting the texts across enemy lines once they were published. (In some ways, it’s surprising just how many German books from 1915 ended up in American libraries). But you also have a steep drop in 1909 in two languages. I don’t know the mechanics of this yet, but I suspect it’s connected to this chart, which shows the words used on Harvard Library checkout slips. Perhaps Harvard collected more Italian and German texts than California and Michigan? Or perhaps there’s an influx of books from some other source that depresses the percentages even as the numbers stay the same?